The Palm Desert and Palm Springs area is full of snowbirds and vacation properties as well as full-time residence. But, if you're thinking about buying a vacation home you're also probably wondering about how to finance it. Unless you have a cool 400 K to put down on a vacation home, you're probably going to finance the property, so what's the best way to do that? Lenders assign different risk based on different factors such as the type of property, credit scores, credit history, and how much down payment the borrower is willing to put down. Also, lenders want to know if you are occupying the home full-time, as a rental property, or as a vacation or second home. A second home or vacation property is occupied by owners at various times throughout the year and maybe up to several weeks or months at a time. If it's a rental property, the owners typically never occupy the home and get monthly cash flow from rental payments. So, even these two factors offer a level of risk to the lender. Naturally, an owner-occupied primary residence has the best rates and terms because most people are not going to let their first home go into default because they need a house to live in whereas a vacation home may not be as high of a priority so the owner may decide to let it go, sell it, or let it go to foreclosure should an issue happen where they can't make their mortgage payment. So, lenders need to consider all of this. For a lender to loan money on a vacation home the transaction has to make sense. It must be located in an area where vacations are typically taken and need a down payment of about 10%. If it's a rental property, you'll need at least 20 to 25% down, so it's important to clarify what type of property this really is. A vacation home can generate rental income if it's not being used by the owners and while that's an attractive feature, lenders may not agree with the situation so it's important to be honest with your lender about how you are using the property. Lenders typically need at least two months of reserves in order to qualify. Credit scores need to be slightly higher than for a primary residence and debt to income requirements can depend on the size of the down payment and your credit score. There are three main ways to finance a second home or vacation property: a cash-out refinance, home equity line of credit, or conventional loan on the home itself. 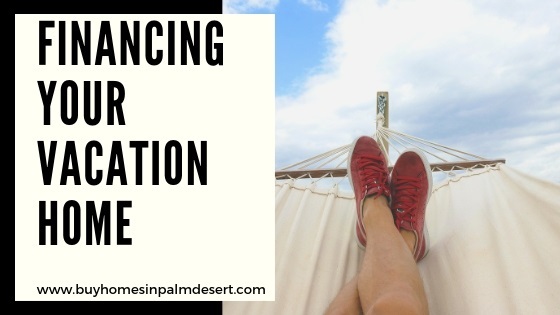 Before jumping into looking at vacation homes it's important to talk to a lender that understands your goals and what you're trying to achieve. By getting a good idea of your credit history and what you're likely to put down on the new home, you could start looking at properties with more confidence.